I have not done much with the aquarium recently. The algae are under control after reducing light levels and times. The Chrysymenia weed is growing everywhere and not looking too pretty. I will have to replace some rocks to get rid of them. My only fish is a Common goby Pomatoschistus microps, who eats bits of shrimp out of my hand. It also attacks Grey topshells when it is hungry. I would like to have have some Goldsinny wrasse and Mullet as they are beautiful and do not seem to fall prey to the Snakelocks anemones, but these species are difficult to catch. I will collect a couple of squat lobsters as they are very entertaining to watch. Ideally Spiny squat lobster Galathea strigosa, as they are among the most nicely coloured animals to be found here. They are not common in the intertidal, although they might be common subtidally (I noticed one in a picture I took of some Bispira volutacornis worms recently). 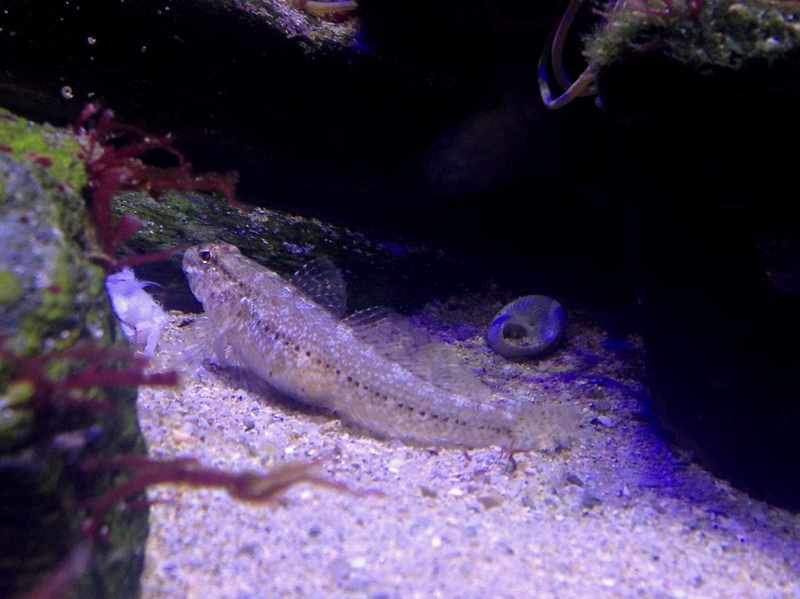 The Goby with a full belly: So for now just a little inventory. Molluscs: Turban- Grey- and Purple topshells, a Sting winkle, Thicklipped- and Reticulated whelks and assorted Periwinkles. Crustaceans: Common prawns and Hermit crabs. Anemones: Beadlet-, Strawberry-, Plumose- and Snakelock anemones and a Red Speckled Anemone. Echinoderms: one Sea urchin, a bunch of Cushion stars, the odd Brittlestar and a nice Seven-armed starfish Luidia ciliaris that I recently found in a rock pool on Castle Beach. This species can grow up to 60 cms and hunts for other echinoderms, let’s see what happens! This entry was tagged Common goby, Luidia ciliaris, Pomatoschistus microps, Seven-armed starfish. Bookmark the permalink. Great Update! Would love to see more of the Luidia ciliaris. Never found one. Would be cool if you can get a video when he is on the hunt for other stars. Where do you usually find Squats? The Juvenile on your picture has deadly coloration, would be nice. 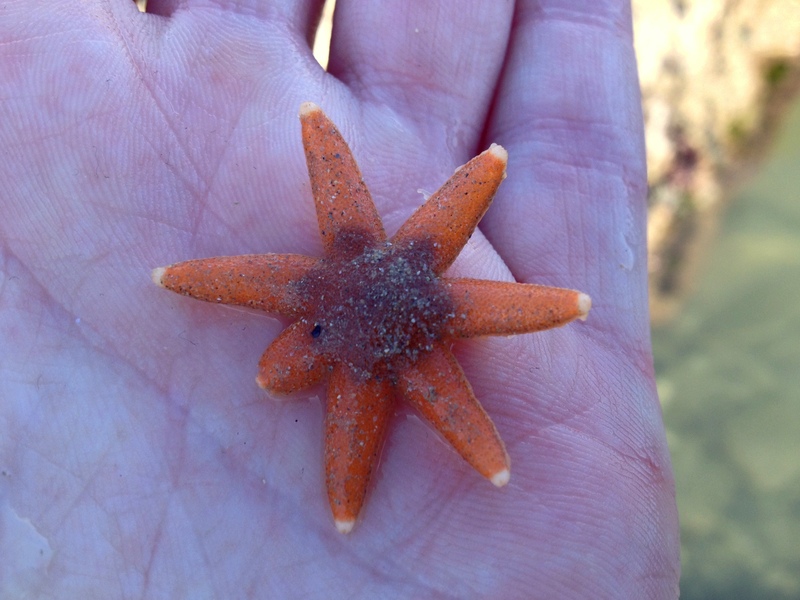 Hey, I went back this weekend and this starfish species was everywhere! In my tank it is under the gravel almost all of the time (like my sand star previously), so not that great. The normal squat lobsters are super common, but the nice spiny one (it’s not the rugose one, I have now corrected the post) I have found only once rock pooling, it is a subtidal species. Probably quite common in crevices, but will be difficult to catch….